Up to 30,000 people in Britain may be silent carriers of the human form of mad cow disease, according to new research published Tuesday. Variant Creutzfeldt-Jakob Disease (vCJD) is the human form of the fatal brain-wasting disease found in cows called bovine spongiform encephalopathy (BSE) - better known as mad cow disease. So far there have only been 177 confirmed human cases in the United Kingdom, according to the study. Forty-nine more cases have been reported in 11 other countries, according to the World Health Organization. Previous research suggested maybe 1 in 4,000 people living in Britain were carrying the protein that causes vCJD, says Dr. Sebastian Brandner, one of the study authors and head of the Division of Neuropathology at Queen Square, one of the largest academic neuropathology departments in the UK. But that estimate was made using a smaller sample, says Brandner. This new study, published Tuesday in the medical journal BMJ, was much larger. Researchers studied appendix samples from 32,441 people and found 16 that tested positive for vCJD. Given that population of the United Kingdom is a little over 60 million, Brandner says that means about 1 in 2,000 people - or roughly 30,000 people total - have this potentially lethal prion. Brandner says the peak of mad cow disease was in 1992, and the peak of the human form of mad cow disease occurred in 2000. This suggests there is an 8-year incubation period for the disease. However, his research has revealed that there are at least three different forms of the prion protein linked to vCJD, which might explain why more people haven't become sick with the disease - yet. "These people may harbor that [vCJD] for a longer time; they may develop a different type of prion disease; they may be silent carriers," says Brandner. He says there's one definite concern: that these silent carriers may be potentially transmitting the disease. There is no blood test to detect vCJD, so someone could unknowingly pass the prion protein on to others when they give blood, and prions are not destroyed by standard sterilization methods usually used for surgical instruments – only harsher, stronger sterilization procedures will kill them. According to WHO, the human form of mad cow disease was first reported in the United Kingdom in March 1996 and the first cases of bovine spongiform encephalopathy, was first reported in the United Kingdom in 1986. More than 184,000 cows in the UK were eventually confirmed to have BSE. The average age of death for vCJD is about 28 years, according to the CDC, which is one way it distinguishes itself from classic Creutzfeldt-Jacob Disease; classic CJD emerged more than a century ago and affects older people. 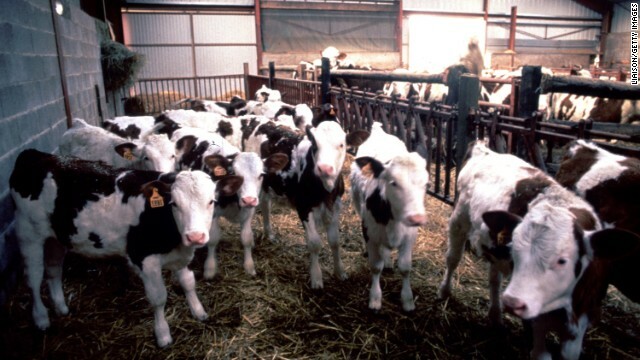 The average age for this disease, which is not linked to the consumption of meat from cattle with BSE, is 68. In an accompanying editorial in the journal, Roland Salmon, a retired consultant epidemiologist, argues that vCJD is not yesterday's news because there are many questions that still need to be answered. He notes that blood tests that could be used widely for screening and diagnosing vCJD are still elusive. He also suggests that the number of precautions taken to secure the blood supply to prevent transmission (which can be costly) needs to continue, because even though there have been only 171 cases of vCJD in the UK, this new research confirms that there could be more cases in the futures. « Previous entryCan brain scientists read your mind? This is definitely scary stuff regarding the potential for transmission by silent carriers. Let's hope that new research will shed light on methods for detecting the disease and that healthcare providers will then encourage those with high-risk factors to get tested. Unless you eat the carrier's brain there is little risk of person-to-person transmission. There are other ways CJD can be transmitted, Kuru. In fact, there have been news stories in the past couple of months about possible transmission to patients undergoing surgery in which contaminated instrumentation was used. The CJD agent has been transmitted through the use of contaminated human growth hormone, dura mater and corneal grafts, or neurosurgical equipment. It has not yet been determined whether it can be transmitted via blood transfusions. When I was in the service station in Germany in the early 80's, the USAFE (United States Armed Forces Europe) "found" 40,000 tons of "surplus" red beef. I thought it was great as every military person stationed in Europe and living off base got 5lbs of free beef weekly. As a single service member it meant food costs were negligible. However... here we are 30 years later and I recently found out I am not allowed to donate blood. Why? because of the fact I was "living" in a European country for more than three months in the 80's (I was stationed there for two years). The American Red Cross told me it's because of "Mad Cow". Makes me wonder what my government was feeding me! feeding meat byproducts back to cows n sheep has caused this, gmo corn n products also chg dna, Alzheimer goes misdiagnosed when actually this!!! n ur hot water heater often has an aluminum anode rod which leaches aluminum which goes directly to ur brain! yeah n u think ur government cares!!???? IF ONE THING DOES NOT get you, SOMETHING ELSE WILL. So, work hard, rest well, vacation often,.. eat well, pass wind-and GET ON WITH IT. This is exactly why we need to shift back to the localized marketplace. Know your farmers. I know my farmer quite well...I raise my own beef, chickens and goats as well as various food crops. I would love to know how that disease is passed on to cattle. I would hate to lose my herd to something like this. I live in Los Angeles and my Uncle recently passed away from CJD, they dont know the source at all. I too have similar symptoms as does my grandma, I recently sent a blood sample to the CDC to see if its the hereditary version. Due to my illness I have had invasive tests were they reuse the equipment on other patients, I am the only one that was at all concerned about this! I am surprised at how doctors here in the second largest city in the U.S. were/are totally ignorant about this illness and how to handle it. I guess you get better healthcare in europe than here. vCJD in deer is known as Chronic Wasting Disease. It occurred in the U.S. a few years ago because the deer population was becoming too big for the land to support it. (There weren't enough blades of grass so the deer were eating the roots. In sheep it's so common there is a generic name for it: scrapies. Sheep generally eat the roots along with the leaves of the plants. So CJD/BSE/CWD must come from some organism living in the soil. CWD in deer is a separate prion disease from vCJD. High deer density contributes to disease spread but is not the source. CWD sick deer shed prions in saliva, feces and urine. The CWD prions do not get degraded and thus, when deer are grazing, they can get infected. BSE came from contaminated meat and bone meal. Prions are not alive. cow:I'm as mad as hell and Im not going to take anymore of this!!! I'M MAD TOO, BUT THE ONLY THING WE CAN DO IS TELL EVERYONE WE KNOW ABOUT THIS AND SEE IF ANYONE MIGHT HAVE ANSWERS. MONEY GREED IS WHAT HAS HAPPENED TO THIS WORLD , ENOUGH MONEY CAN PASS ANYTHING THROUGH. WE HAVE GOTTEN SLOPPY ABOUT SEEING THAT OUR FOOD IS CLEAN AND COMES FROM THE RIGHT PLACE, OUR OWN COUNTRY THE USA. WE ARE GETTING OUR MEDICENES FROM OTHER COUNTRIES. WE COULD HAVE ALOT OF JOBS FOR PEOPLE IF WE TOOK CARE OF OUR OWN MEDS AND FOOD, ETC. OUR COUNTRY NEEDS TO PRAY AND BELIEVE AGAIN. GOOD LUCK TO YOU AND YOURS. Having lived in Europe for more than six months in the mid 1980s - actually it was for three years in Britain - I am not permitted to give blood in this country in the off chance I am a CJD carrier. As a result, there are thousands - think of all the US military people based in Europe in that period - who are banned from giving blood by the American Red Cross. You weren't banned by the Red Cross. You were banned by the FDA. They are the ones who determine who is/isn't allowed to give blood. For example the Red Cross believes that the lifetime ban on MSM should be removed but the FDA wont lift the lifetime ban. I was shocked to find out the same thing when I went to donate blood earlier this year. We were stationed in Germany 1984-85. When I questioned the supervisor of the blood donation site he said that when they begin research on developing a blood test for CJD, the money gets diverted to other more high-profile/urgent research. I find this especially disturbing since I donated a kidney to a family member less than 2 years ago. My mother passed away to CJD on 11/11/88 in Munich and the last time I tried to give bood I was told I couldn't. I know someone who recently died of this disease. It is likely that she ate contaminated beef. She could have eaten it as much as 50 years ago! Once it became a progressive disease, it took less than 2 months to kill her. Scary stuff! Interesting, the commissaries and the US military stationed in Europe in the late 80's and early 90's was supplied beef by Great Britain. I tried to give blood once in the late 90's after I had left the service, but was denied because I had been stationed in Germany in the late 80's and early 90's. I have not been out for 19 years. I have had no symptoms thank goodness. My mother's mother died of an unknown disease that presented itself and 1978 and took her life in 1981. An extensive study of her brain cells led the researcher to report back to the family that it was like CJD. The researcher also warned the family that it was believed there was a genetic component and that it skipped generations leaving me as a candidate for developing the same condition. I wish there was a test. well well well.. .this certainly explains the behavior of the tea party. exactly. slowly, not like the overnight horror in the movies. oh well, thanks for the fish! Fewer Englishmen in the world can only be a good thing. Now if we can just spread Mad Cow Disease to Texas. "prions are not destroyed by standard sterilization methods usually used for surgical instruments – only harsher, stronger sterilization procedures will kill them." Prions aren't alive, you CNN nincompoop. So they can't be killed...ever. They can only be made inactive. The proper word is denatured. General public doesn't get that though. They understand that "kill" means gone. I suppose as a vegan I should still worry about this, but perhaps a little less. There is a direct link to the bovine components in many vaccines. Why is this not even mentioned here? Oh, it's CNN, that's right. My bad. Don't forget about the Autism .. if you're going to bunk, go full-force. "... prions are not destroyed by standard sterilization methods usually used for surgical instruments – only harsher, stronger sterilization procedures will kill them." Prions are not alive and so technically you cannot kill them. They are self replicating proteins. The prion is a mis-formed protein that can change the shape of normal proteins that they match. Currently there is no treatment for prion disease and it is always fatal if you live long enough. Another good reason to avoid blood/plasma transfusion if you can. Semantics .. heat (et.al.) don't "kill" a virus either .. they just denature the DNA essentially putting it in random (useless) order. Same goes for prions, except you've got to get it hotter. THERE WAS A FRIEND OF MINE A COUPLE YEARS AGO THAT DIED WITH MAD COW AND IT WAS CONFIRMED. HE LIVED IN OHIO, USA. HE WAS IN HIS LATE FIFTIES. I DO THINK ALOT OF PEOPLE AROUND THE AREA HAVE MEMORY PROBLEMS. WHEN A TALK SHOW HOSTESS TRIED TO TALK ABOUT MAD COW AND BEEF SHE WAS SUED. SO WHAT ELSE ARE THEY NOT TELLING US ? GOOD LUCK TO US ALL. MONEY GREED IS WHY EVERYTHING HAS GONE WRONG. Your keyboard is stuck in All Caps mode. Please press your Caps Lock button again. Shouting at us doesn't help your opinions make more sense. vCJD may be a coming plague according to a neuropsychologist whose seminar I attended some years ago. It can take decades to reach clinical manifestation and beef consumption is just part of the problem. For instance, many home garden fertilizers have bone meal in them which can contain the prions that lead to the disease. Before I retired as a social worker I saw patients afflicted with the disease and it is tragic. Once it hits clinical manifestations, life expectancy is a matter of months. Let's not forget the millions of American veterans and their families who served and lived in Europe during this time and are forbidden to donate blood even today. They aren't considered disabled, they don't receive any compensation. The only time the subject comes up is when they answer the American Red Cross blood donation forms and then are told they aren't eligible to donate blood. This is an especially egregious hardship on America's homeless veterans who don't even have the option to sell their platelets. Isn't this the disease that cows get when dead animal parts are ground up into their food (to save money, of course), not only forcing them to be carnivores, but also cannibals? It is reprehensible that the US has prohibited meat producers from not only marketing their products as BSE (mad cow disease) free but they are not even allowed to test for it! Does anyone know what happened with those 13 mad cows from Canada? I stopped eating beef except organic since then. There may less cause for alarm – the number of deaths has declined lately. How old were the deceased who were studied and how many were potentially exposed? There was a drastic change in the feeding of cattle over a decade ago. Fewer than 30,000 are likely carriers since all those born after 2000 are probably not affected.In the US, those under 15 years represent about 20% of the total. If that calculation was figured in here, it would drop the estimate by 6000. Not great, but better. I was stationed in eastern Turkey from '96 to '99 and have been unable to give blood as well. By that time, the world was well aware of what was happening with BSE and vCJD and all our meat was packaged in airtight packaging, frozen, and flown over from the states. My Mother-In-Law passed a few years ago of CJD. It was brutally fast as it claimed her, fewer than 4 weeks from nearly full functionality to unable to swallow. No one can tell how she got CJD, she had a blood transfusion a few years earlier and that seems to be the most likely cause, but it may be genetic too (which is where blood donation restrictions for my wife and children stems from). I hope more can be done to figure out this disease and I applaud those working toward that end. I guess the French wont be eating anymore Brits. Variant Creutzfeldt-Jakob Disease (vCJD) is the human form of the fatal brain-wasting disease found in cows called bovine spongiform encephalopathy (BSE) – better known as mad cow disease. So far there have only been 177 confirmed human cases in the United Kingdom, according to the study. Forty-nine more cases have been reported in 11 other countries, according to the World Health Organization. This new study, published Tuesday in the medical journal BMJ, was much larger. Researchers studied appendix samples from 32,441 people and found 16 that tested positive for vCJD. Given that population of the United Kingdom is a little over 60 million, Brandner says that means about 1 in 2,000 people – or roughly 30,000 people total – have this potentially lethal prion. Brandner says the peak of mad cow disease was in 1992, and the peak of the human form of mad cow disease occurred in 2000. This suggests there is an 8-year incubation period for the disease. However, his research has revealed that there are at least three different forms of the prion protein linked to vCJD, which might explain why more people haven't become sick with the disease – yet. I notice several posts from ex-US Military service members about not being able to donate blood because they were stationed in Europe in the 1980's. The potential of eating infected beef from Great Britain during that time was a real possibility; especially beef supplied at the Commissary on base. As a former USAFE service member stationed in the UK from 1984 to 1987, I am not allowed to donate blood (even though I am O NEG) either. The more frightening possibility is that I may have vCJD and potentially transferred to unknown people when I was able to donate blood before the ban was put in effect. Why do they call it mad cow? My uncle passed away two years ago in December. He had a kidney transplant the year before – within six months, he was hospitalized and diagnosed. Turns out, the kidney he'd received contained vCJD. My uncle, who suffered through seven years of hell waiting for a kidney, only got to enjoy his retirement for six months. I'm sure I'm not the only one. RIP Uncle Bruno. I wish people would see this for the threat it really is and start testing for this. Imagine how many people could be infected and not know it. Now I know why Indians keep cow as sacred and dont eat them. Prions are the nastiest bug out there. There are no cures, and no vacines, and it would be hard to imagine there ever being one. they can survive intense radiation, boiling water, 300 degree heat, and a veriaty of harsh chemicals. There is a reason infected cows are burned, not just killed. They aren't alive, they are made of pure protine with no dna. Yet they can reproduce inside your brain. Truely the stuff of nightmirrors. Somebody necessarily assist to help to make critically content articles I might point out. This is the very first time I visited your web page and to now? I surprised with the research you more product built to create this specific put up extraordinary. Great job! Hi my friend! I would like to say that this kind of post is amazing, great written and include almost all critical infos. I would like to see more product much more posts similar to this. Appreciate you soome other informative internet site. Where more product in addition could We are getting that will kind of data written such an ideal method? I've a new mission this I'm simply now operating on, and I have been on the glance more product out and about for these kinds of info. I appreciate sensible review. Me in addition to my neighbor were only preparing to do some research within this. We got more product the grab a book by our area library although I think My spouse and i learned much more from this publish. I'm incredibly glad to discover such good information staying shared widely more product out there. I'm also not allowed to donate blood, because I lived in England and Germany on and off from 1986-1997. At the same time, I can't get doctors to take me seriously, despite deteriorating symptoms, because there's no test. I don't know where to even begin to find hope. There is a blood test now for it. My husband is back!! I was with my ex partner for 8 yrs and in september last year he left me and took my kids and i have not had contact with them for 6 mths. He has a new girlfriend but he does not treat them right. I really need him and my kids back. They are the loves of my life and i am so empty without them. I need help, i saw a post by Natasha from united states who testified of Dr Unity the spell caster. I contacted Natasha to confirm about Dr Unity and she guaranteed me and gave me the courage to contact Dr Unity for help. So, i contacted him and he assured me that my days of sorrows are over that i will get back my partner within 48hours. I did all what he told me and am very happy that my partner and my kids is back to me and we are now living happily like never before and i can boldly and proudly testify to the world that Dr Unity is a good and remarkable spell caster that specializes on different kind of spells. If you need his help, then contact him on his Email: Unityspelltemple@gmail.com .